Shopping for Mother’s Day gifts this year, eco-conscious shoppers are choosing among a range of stylish earth friendly presents. The editors of VERDANT Magazine conducted a survey and came up with this list of the year’s Top Ten Green Mother’s Day Gifts. 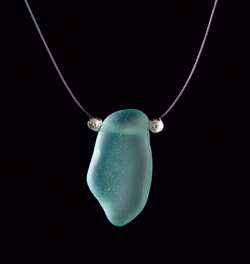 Single-Glass Illusion Necklace Washed ashore and polished to translucence, found beach glass is fashioned with sterling silver into a delicate pendant necklace. Ruffled Cloud Silk Scarf |Wrapped or draped, this hand-weave silk is colored with natural sky-blue dyes for purity and environmental safety. 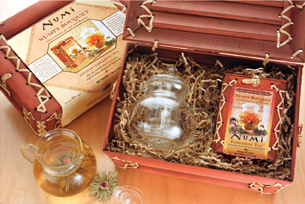 Flowering Tea Gift Set| Making tea is an art with this set of handpicked, organically grown, green, white and black leaves. When steeped in water, the hand-sewn into rosettes slowly blossom into beautiful flowering shapes as they release their flavors. The kit’s glass teapot makes it easy to watch the petals bloom. $14.95 for a packet of four.